In this study, a 250-W permanent magnet alternator driven by wind turbine and a 12- V/75-W solar cell panel were used as the wind and solar energy source, respectively. Both energy sources were output to 12-V/75-AH lead batteries, which were kept in under­charged condition before test. 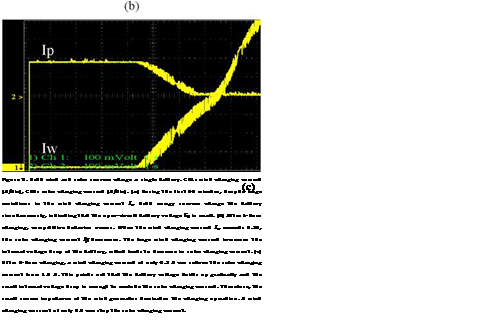 In the experiment, a 100- MHz scope was employed to measure the charging current and battery voltage. 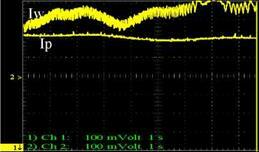 A current probe set at 100 mV/A was utilized to sense the charging current. The alternator outputs were converted into DC output by a rectifier module to charge the batteries. As shown in Fig. 8, there was a large variation in current and voltage because of the unstable wind speed. 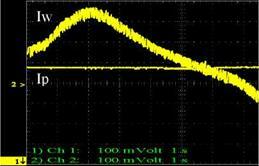 The fluctuations in amplitude of the charging current were attributed to the conventional AC-DC rectification effect. Increase in wind speed also led to increase in charging current. The variation in battery voltage as a result of internal impedance is above 1V. Figure 8. Charging current (Ch1: A/div) and battery voltage (Ch2: 5 V/div) of wind power. 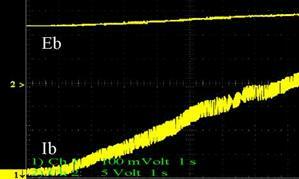 Owing to the source resist­ance of the battery, the internal voltage drop increases with the charging current Ib. This leads to the increase in the battery voltage Eb. A battery was charged by wind and solar energy sources using the conventional wind and PV charging system, as shown in Fig.3. In the first 30 minutes, the battery remained in an under­charged condition. Asshown in Fig. 9(a), the stable 0.8-A PV charging current is not affected by the large variation in wind charging current. After 1 hour, as seen in Fig.9(b), thecharging curve of solar energy shows an opposite trend as that of wind power. The solar charging current decreases as the wind charging current increases. After 2 hours, as shown in Fig. 9(c), either solar energy or wind power dominates the charging behavior. When the wind charging current exceeds 3 A, the solar energy source does not output any power. Therefore, the system cannot get both wind and solar energy at the same time.